Dance Academy One is bringing returns in 2018 to bring a dance extravaganza to the Langstone Cliff Hotel. Welcoming beginners and offering tuition, Lawrance is adept at hosting dance weekends away at various UK destinations and we have seen his talents before at Langstone. Lawrance has over 40 years of dancing experience so you won’t find a better teacher! His passion for dancing is evident to all who meet him – it’s rare to find a teacher who enjoys the class as much as their students do. The pre-recorded music and Lawrance’s enthusiasm will have you up and dancing in no time. Our dance breaks are normally hosted in our air-conditioned Washington Ballroom. Fitted out with a large sprung, strip maple dance floor this space is perfect for perfecting your steps! For larger events, the Washington Ballroom extends to the Lincoln Suite to offer a more fully functional space. To book a space on Lawrance’s dance break send Dance Academy One an email or call him on 07976869178. 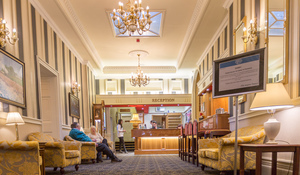 To reserve a room at the hotel, you can book online here or for further information please contact the hotel directly on 01626 221329 quoting ‘Dance Academy One Dance Holidays’.